Afang soup is a delicacy of the Ibibios and the Efiks in Akwa Ibom and Cross River State of Nigeria. 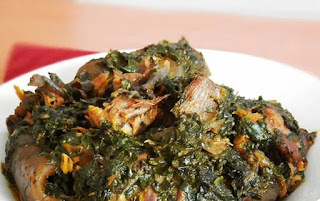 It is prepared from shredded afang leaves, “water leaf” (Talinum triangulare ), and an assorted selection of smoked fish, stock fish, meat and crayfish. Served with fufu, gari, or pounded yam, it is a truly delicious authentic African food. It is a must in all ceremonies like child’s birth, weddings, even funerals. The appearance of afang soup might be a little threatening to new comers, but it is a very delicious soup and I am saying this from experience. In the past, the afang leaves were only collected from the forest but in Nigeria, we now grow them even in our backyards. They are found growing in isolation or amidst of grasses or weeds. 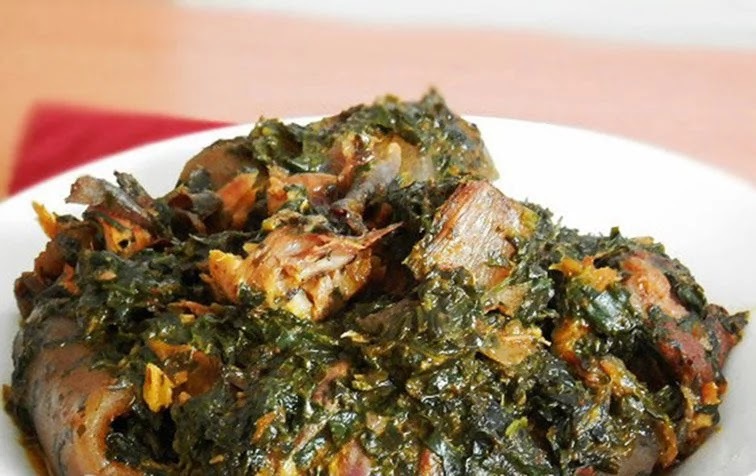 Afang leaves (Gnetum africana ) can also be eaten raw as prepared by the Igbos in the popular African Salad “Ugba”. The people of the republic of Congo also consume the afang leaves which they call “Mfumbwa”. Afang leaf is so named by the Efiks and Ibibios, Igbos call it “ukazi”, “Eru” by the Cameroonians and “koko” in Congo. The other leaf used in the afang soup is the water leaf or fame flower (Talinum triangulare ) which is found in many countries in West Africa, Central African, some southern parts of USA but mostly cultivated in Cameroon and Nigeria. The soup, like all other African food soup, is highly nutritious, since it contains a copious blend of vegetables, fish and or meat, along with needed lipids, minerals and vitamins. The Afang leaf itself serves as a dietary fiber which helps in proper digestion and gives a bulk feeling, vital for a good weight control diet. It also contains Vitamin A, fat, oil, and iron. Waterleaf has higher levels of nutritionally-important vitamins (such as vitamin C, vitamin E, and Beta-carotene, minerals such as calcium, potassium, magnesium, and soluble fiber known as pectin and purslane, all of which contribute to waterleaf’s highly-elevated antioxidant values and its total biological effect. The combination in one plant species of n-3 fatty acids, antioxidants, and pectin that consequently has a positive and beneficial influence in reducing the risk of cardiovascular diseases in humans. Water leaf contain some substances that reduces harmful blood cholesterol and simultaneously increasing beneficial blood cholesterol and vitamin and mineral levels using such food compositions and of treating and preventing coronary heart disease using such food compositions. * With the aid of a cutting board, slice afang leaves into tiny pieces, turn into a bowl and set aside. On the other hand, in Nigeria you could buy the already sliced leaves from the market, but you still need to wash and dry them before use. * Season meat, stockfish head, snails, and clams, with onions, pepper, seasoning and salt.Except the cow leg /tail that is set aside in different bowls. * Bring pot down and serve with fufu Pounded yam or garri e.t.c.